The Lonesome Whistle of a Train ... bringing the gallows closer to a desperado - the showdown nearer to his captor! Struggling rancher and family man Van Heflin sneaks captured outlaw Glenn Ford out from under the eyes of his gang and nervously awaits the prison train in this tight, taut Western in the High Noon tradition. Adapted from an Elmore Leonard story, this tense Western thriller is boiled down to its essential elements: a charming and cunning criminal, an initially reluctant hero whose courage and resolution hardens along the way, and a waiting game that pits them in a battle of wills and wits. Glenn Ford practically steals the film in one of his best performances ever: calm, cool, and confident, he's a ruthless killer with polite manners and an honorable streak. Director Delmer Daves sets it all in a harsh, parched frontier of empty landscapes, deserted towns, and dust, creating a brittle quiet that threatens to snap into violence at any moment. Remade in 2007 with Christian Bale and Russell Crowe, we need to head back to 1957 for the original version of 3:10 to Yuma. In this western, a drought drives cattle rancher Dan Evans (Van Heflin) to the brink of bankruptcy. He needs $200 to gain access to a stream that would help the situation, but when he can get into town to ask for a loan, events intervene. Ben Wade (Glenn Ford) and his gang just robbed a stagecoach. Though his subordinates ride away, Wade gets captured. Because the locals fear Wade’s goons will return to town and shoot up the place, they want him escorted away as soon as possible, which means someone needs to take him to the town of Contention so Wade can be placed on the 3:10 train to Yuma. Given the danger that comes with this assignment, no one seems eager to accept, but eventually Evans agrees – largely because coach owner Mr. Butterfield (Robert Emhardt) offers a $200 reward for this action. We follow Evans’ attempts to get Wade to the train and the drama that comes along the way. If one wanted to draw parallels between Yuma and 1952’s High Noon, one could do so pretty easily. Both feature men stuck in a tough predicament and forced to deal with poor odds and ticking clocks. Both also lead toward climaxes that inevitably involve shoot-outs between the forces of good and bad. That said, Yuma never feels like a knock-off of Noon, and it becomes a Western classic in its own right. The major difference comes from the nature of its lead characters, as I think Yuma provides much more three-dimensional personalities. As much as I like Noon, I can’t claim that Gary Cooper’s Kane presents a particularly nuanced character, and villain Frank Miller (Ian McDonald) acts more as a threat of impending doom than as a full-blooded personality. In addition, Kane and Miller spend little time on-screen together. By contrast, Wade and Evans occupy the same scenes much of the time, and those become the film’s best. As they wait for the train, Wade and Evans get stuck together in a hotel room, and Wade does his best to play the Devil. To gain his freedom, Wade throws one temptation after another at Evans, and these sequences give us real tension. That’s because Wade is no mustache-twirling psychopath and Evans lacks the steely resolve usually seen in this sort of role. I’d find it hard to think of many Westerns with better-developed leads, as both Wade and Evans create rich personalities, and their lack of simplicity lends a sense of unpredictability to the events. Within reason, that is. I understand that no Hollywood Western from 1957 will let the bad guy win, so there’s zero chance that Wade will succeed in his Last Temptation of Evans. It’s inevitable that Evans will eventually discover his courage and act in a heroic manner. Nonetheless, the path Yuma takes to that climax proves to be tense, largely due to the lead performances. Ford delivers a villain for the ages, as he makes Wade charming, confident and likable – all the opposite of what we’d expect from a cold-blooded killer. He brings a delightful air of cool charisma to the part; you don’t know if you want to buy him a beer or see him fry in the electric chair – or both. Heflin gets the less showy part but he comes across with equal skill as the beleaguered rancher. Evans offers a tough character, as the actor needs to give him a sense of weakness but also convey the potential for strength – all while we also wonder if he’ll cave to the temptations offered by Wade. Heflin portrays the part with a nervous ease; he doesn’t overplay the character’s traits, as he turns Evans into a realistic lead. Toss in some light humor and good action and Yuma ends up as a terrific Western. It may not enjoy the same reputation as legendary films like High Noon and The Searchers among “non-aficionados” but it should. 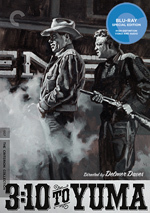 3:10 to Yuma appears in an aspect ratio of approximately 1.85:1 on this Blu-ray Disc. This was a splendid presentation. Sharpness tended to be excellent. A few shots looked a tad soft, but those were rare, as the vast majority of the flick offered strong delineation. I saw no signs of jagged edges or shimmering, while edge haloes appeared to be absent. Print flaws failed to appear, and I sensed no digital noise reduction; the movie came with a smooth and appropriate layer of grain. Blacks came across as deep and rich, while shadows seemed positive. The movie always looked terrific. In addition to the film’s original monaural audio, the Blu-ray delivered a remixed DTS-HD MA 5.1 soundtrack. Don’t expect a lot of fireworks from the soundscape, though, as the majority of the film remained essentially monaural. Music and speech remained centered, and most effects remained in the front middle as well. The mix did open up on occasion, however. These moments usually occurred when horses rode from place the place; at those times, the effects could crop up in the side and rear channels. I also heard thunder from the surrounds as well as gunfire. I thought these added a bit of depth to the proceedings but didn’t feel the 5.1 remix improved the movie in any way. Audio quality seemed fine, as speech worked well enough. The dialogue lacked notable edginess and remained intelligible and relatively warm along the way. Music appeared reasonably full, with acceptable range. Effects fared the same way. Louder elements were fairly clear and the whole shebang delivered a good sense of accuracy. This was a perfectly decent mix that held up well over the decades. How did the Blu-ray compare to the DVD from 2007? While the Blu-ray added a new 5.1 track, I didn’t prefer it to the original monaural. The former didn’t add much involvement and the latter worked just fine. I appreciate the inclusion of the remix option but would select the mono in the future. Visuals showed a substantial upgrade, as the Blu-ray was tighter, cleaner and more film-like. The DVD was a good representation of the movie but the Blu-ray outdid it in every way. Criterion’s Yuma comes surprisingly light on extras. In a 13-minute, one-second Interview with Author Elmore Leonard, he covers aspects of his career and the original Yuma story as well as influences, the 1957 movie, and later occurrences. We get some good notes in this short but enjoyable piece. The son of star Glenn Ford, Peter Ford chats for 15 minutes, four seconds. He discusses Glenn Ford’s career as well as life as a kid in Hollywood. We don’t learn much about Yuma but Peter offers some interesting comments – especially when he tells us his dad’s attempt to educate 10-year-old Peter about “the birds and the bees”. The package finishes with a 20-page booklet. This includes some photos and credits along with an essay from critic Kent Jones. It adds some value to the set. As a film, 3:10 to Yuma provides a rich, involving drama with nary a misstep on display. In particular, its lead actors delight with full-bodied performances. The Blu-ray offers excellent visuals and good audio but lacks substantial bonus materials. The absence of extensive supplements disappoints, but the Blu-ray brings us the movie in fine fashion.